Make sure to read all of our coverage on our website, cm-life. com. Isaac Ritchey | Staff Photographer Calumet junior Olivia Torala, right, and her date, Olivia Campbell of Mount Pleasant, dance at the Gender and Sexuality Alliance Spectrum’s Pride Prom April 12 in the Center for Inclusion and Diversity at Bovee University Center. d e ? n e g s i a S e t ' L n e s Hav ext Year' N Well, at WEST CAMPUS VILLAGE, you won’t live in a shoebox... and, it’s so close to campus you don’t need a pricey parking permit! FREE INTERNET FREE GYM MEMBERSHIP FREE SUMMER STORAGE FREE PARKING & PET FRIENDLY TOO! Hunter McLaren | Staff Reporter Central Michigan University’s Board of Trustees speak at the meeting April 11 in the Bovee University Center President’s Conference Room. WCC offers a wide range of online classes during the Spring/Summer semester. Washtenaw Community College offers a wide range of Spring/Summer semester classes to help you catch up, stay on track, or get ahead to ensure timely graduation. meant to factor in the higher costs of these more intensive courses. “This is a very positive change that’s been under consideration for a number of years,” said Trustee Richard Studley. “These changes do a much better job matching up tuition rates to costs, in addition to setting our rates earlier for prospective students and parents to make their decisions earlier.” Twelve other public universities in Michigan implement a lower/upper level tuition system – only CMU, Lake Superior State and Saginaw Valley State have kept a flat tuition rate. By having a differential tuition system, prospective students and parents can more accurately compare CMU’s costs to other universities. “We do not want to be the cheapest university, but we want to be able to provide excellent value,” Davies said. The lower level tuition rate for nonresident undergraduates will be $789 per credit hour, while the upper level rate will be $815 per credit hour. In addition, trustees approved a resident graduate tuition rate of $637 per credit hour for a Master’s degree, and $726 per credit hour for a Doctoral degree. REGISTRATION FOR SPRING/SUMMER CLASSES Now Open! Hunter McLaren | Staff Reporter Austin Harper (left), Sam Russell (center) and Reid Rooney (right) hold a giant check for $25,000 at the New Venture Competition awards ceremony April 12 in McGuirk Arena. they need to know (during the workshops), so the New Venture Competition is a culmination of all that,” Meyers said. Human Services. At the end of three rounds, the remaining teams were eligible for one of five $10,000 prizes, a $25,000 prize, or one of three $30,000 prizes. Awards were given out after dinner in McGuirk Arena. The $25,000 award for best overall venture went to three entrepreneurs behind the “Betsperts” app. The app was created by Reid Rooney, Sam Russell and Austin Harper. Rooney and Russell graduated from Central Michigan University in 2012 and played baseball together, while Harper graduated from Clemson University and met Rooney while working with him at a previous job. Betsperts is an app that acts as a social media platform for sports gambling that aims to provide transparency as it becomes more legal around the country, Rooney said. “We really appreciate the leadership here and for what this organization puts on for new ventures and businesses like us as we get started,” Harper said. Megan Doyle | Staff Reporter Marysville sophomore Julie Martin, left, and St. Clair sophomore Emmy Marcath hold up Love Your Melon signs during the Relay for Life event April 13 at Finch Fieldhouse. the event. There were several cancer survivors there as well, who took two laps around the track during the opening ceremony. Many of them had CAC members with them, and some had tears in their eyes. One of these survivors, Aaron Rop, spoke during the opening ceremony about his experience. He discovered that he had cancer while he was in the Navy and endured six months of chemotherapy. He said that all he wanted to do was to go to CMU after treatment, which he was able to when he completed community college. Another cancer survivor who participated in the event was Renee Sheneman, who was diagnosed with lung cancer in August of 2018. She said she had been participating in these relays for 15 years, since her father was also a cancer patient and passed away when she was 15 years old. This was her first relay as a cancer patient which, made her focus on the fundraising aspect even more. Renee said she hopes other survivors will connect with others and find support through them. ALL THE COMFORT YOU DESERVE AT GREAT PRICES! retired executive vice president and chief financial officer of The Dow Chemical Company, on the board may help do that. You might even want to consider someone with a background in education. At the Feb. 1 Michigan Press Association annual convention in Grand Rapids, Whitmer talked about what qualifications she would consider before appointing an applicant to the board. “... it’s about demanding answers to questions regarding student safety, to affordability, to ensuring that our universities are able to live up to our high expectations of delivering a great education,” she said. That sounds excellent. This October, when you appoint two new trustees Gov. Whitmer, also take diversity into account. You are the only one who can do something about it. 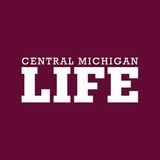 Central Michigan Life, the independent voice of Central Michigan University, is edited and published by students of Central Michigan University every Monday, and Thursday during the fall and spring semesters. The newspaper’s online edition, cm-life.com, contains all of the material published in print, and is updated on an as-needed basis. Central Michigan Life serves the CMU and Mount Pleasant communities, and is under the jurisdiction of the independent Student Media Board of Directors. Dave Clark serves as Director of Student Media at CMU and is the adviser to the newspaper. Articles and opinions do not necessarily reflect the position or opinions of Central Michigan University. Central Michigan Life is a member of the Associated Press, the Michigan Press Association, the Michigan Collegiate Press Association, the Associated Collegiate Press, College Newspaper Business & Advertising Managers Association, the Mount Pleasant Area Chamber of Commerce, Central Michigan Home Builders Association, Mount Pleasant Housing Association and the Mount Pleasant Downtown Business Association. The newspaper’s online provider is SN Works. Central Michigan Life is distributed throughout the campus and at numerous locations throughout Mount Pleasant. Non-university subscriptions are $75 per academic year. Back copies are available at 50 cents per copy, or $1 if mailed. Photocopies of stories are 25 cents each. 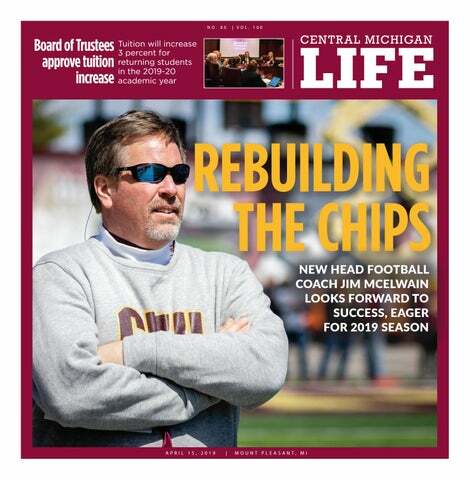 Digital copies of photographs published in Central Michigan Life are available upon request at specified costs. Central Michigan Life’s editorial and business offices are located at 436 Moore Hall, Central Michigan University, Mount Pleasant, MI 48859, telephone (989) 774-3493 or 774-LIFE. Conference First Team members. Joining CMU isn’t the first time McElwain has attempted to rebuild a program from the ground up. Nicknamed “A Bold New Era” by the Colorado State athletic department, McElwain walked through the doors in 2012 following three-straight 3-9 seasons for the Rams under coach Steve Fairchild. Colorado State, in its first game with McElwain at the helm, rallied from down 11 points against archrival Colorado for a 22-17 victory at Sports Authority Field on Sept. 1. The win made McElwain the first Rams’ coach in history to take down the Buffaloes in his career debut. McElwain’s crew finished 4-8 that season. Just two years later, Colorado State went 10-3 – McElwain was named the 2014 Mountain West Coach of the Year. The hope is that the exact same will happen to the Chippewas in Mount Pleasant. OFFENSE: RELIABLE QUART ERBACK MUST EMERGE A season ago, Bonamego made the mistake of starting junior Tony Poljan, now a tight end, at quarterback to open the 2018 campaign. It didn’t end well, as Poljan was benched within three games. McElwain has a variety of options, one of which is returning senior Tommy Lazzaro. Others include Houston graduate transfer Quinten Dormady, junior NJCAA transfer David Moore, redshirt freshman George Pearson and true freshman Daniel Richardson. Along with Poljan, former quarterback Austin Hergott also switched to tight end. McElwain is in no rush to name a signal caller for the 2019 season. He enjoys the tight competition and expects the summer months of training to iron out which one is the right guy for the job. Isaac Ritchey | Staff Photographer Central Michigan senior quarterback Quinten Dormady throws a pass at spring practice April 13 at Kelly/Shorts Stadium. back to his old days, and McElwain said he’s well on track. “He’s a pretty good football player,” McElwain said. “I’m glad he’s a Chippewa.” The offense, as a whole, carries a greater weight than in past seasons due to the loss of stardom on defense – cornerbacks Sean Bunting and Xavier Crawford to the 2019 NFL Draft, defensive end Mike Danna as a transfer to Michigan and Malik Fountain, Alex Briones and Trevor Apsey to graduation. DEFENSE: TIME TO FILL BIG SHOES Since Bunting, Crawford, Danna, Fountain, Briones and Apsey are out the door, many positions are open to take. The linemen that spent the most time on the gridiron Saturday were senior defensive end Sean Adesanya, redshirt freshman defensive tackle LaQuan Johnson, senior defensive tackle D’Andre Dill and sophomore defensive end Amir Siddiq. Defensive coordinator Robb Akey raved about the talents of Johnson, who recorded 15 tackles, 4.5 tackles for a loss and one sack in four 2018-season games. “I’m really excited about (Johnson’s) future,” Akey said. “He’s got size, good quickness, and I think he’s a great kid. It means a lot to him because he’s working at it. “I told him, ‘I’m going to buy some stock in your future, big boy.’” However, the expected standouts at linebacker and defensive back are unknown as two starting linebackers and two starting cornerbacks are no longer in town. But each position group became a little more clear throughout open practice. Michael Oliver, the lone senior linebacker, played alongside sophomores George Douglas and Andrew Ward on what seemed like the first team defense. Oliver said his crew is still learning to match the production of Fountain and Briones. For the defensive backs, senior Da’Quaun Jamison and sophomore Devonni Reed played with the first team at safety. The two cornerbacks with the apparent starting group were sophomores Brandon Brown and Darius Bracy. “Bracy is the more physical one, so you gotta use your body against him,” Sullivan, wide receiver, said. “Brown, he’s faster, so whatever you do, you gotta do it as fast as you can just to get rid of him.” McElwain noted that the safeties, which include Jamison and Reed, have evolved into defensive leaders. Jamison, a veteran, agreed. Isaac Ritchey | Staff Photographer Senior running back Jonathan Ward stiff arms sophomore defensive back Norman Anderson at an open spring practice April 13 at Kelly/Shorts Stadium. “We’re being very detailed, very coachable guys and sticking to that,” Jamison said. “Everybody’s competing every day and the depth chart is changing every day.” During the scrimmage portion of practice, the Chippewa defense made three-straight stops. The offense was unable to move the ball, regardless of which quarterback was in. The defense was outplaying the offense for the first time, and their leader, Akey, fired them up for it. “I got one request now, dammit,” Akey said. “Back-to-back-to-back three-and-outs: Why do you just walk off the field? How come I don’t see a little swagger?” McElwain is here to write a new chapter in the program’s book. Putting pen to paper has already begun. Isaac Ritchey | Staff Photographer Head coach Jim McElwain speaks to a huddled CMU football team April 13 after an open spring practice at Kelly/Shorts Stadium. Isaac Ritchey | Staff Reporter Mississippi freshmen Tyler Tobias and Piper Mophett, both museum employees, sit in the colorful interior of a 1971 Volkswagen bus named “Honey Bear” April 10 at Rowe Hall. a CMU graduate and ROTC member. Martin is not alone in his antics. Mississippi freshmen Tyler Tobias and Piper Mophett, both museum employees, turned back their appearance by 50 years and sported hippie clothing. While perusing the city, Mount Pleasant graduate student Marc Van Horn watches out his passenger-side window in purple-tinted glasses for people who may be attentive to the hippies. One of the promotional devices used by the group is called “Circle ‘C.’’’ Martin compared the act of jumping out the van’s side door and circling the vehicle before climbing back in to the more common “Chinese fire drill.” “Honey Bear” has been painted with chalkboard paint, allowing students and residents to express themselves during a stop. At the end of the day, Martin documents drawings and saves the best while making room for others. “No one’s seen something like this since the 70s,” Martin said. For those who do not see “Honey Bear” around campus or Mount Pleasant, Martin is moving the vintage van to the museum lobby for the grand opening of their exhibit at 4 p.m. April 22. Martin said the Volkswagen will also participate in CMU’s upcoming homecoming parade. He hopes members of the CMU class of 1969 will be walking alongside the vehicle. YOU PAYITIT YOUPAY PAY IT Join Joinour ourexclusive exclusive YOU Program! Program! FORWARD. FORWARD. FORWARD WE WEPAY PAY WE PAY ITITBACK. BACK. theforumapartments.wordpress.com Copyright © 2019 Takeda Pharmaceutical Company Limited. All rights reserved. Copyright © 2019 Takeda Pharmaceutical Company Limited. All rights reserved. led by running back Jonathan Ward, wide receiver Brandon Childress, offensive lineman Steve Eipper, quarterback Tommy Lazzaro and quarterback Quinten Dormady. Dormady was the lone "captain" of the Kids Clinic who is a newcomer to the program. He's here as a graduate transfer from Houston after also spending time as the starting quarterback at Tennessee. Presnell and the team captains brought their respective groups on tours of the locker room before heading to Kelly/Shorts Stadium to participate in drills. Evan Petzold | Assistant Sports Editor A participant of the Kids Clinic runs with the football as Central Michigan athletes cheer for him on April 13 at Kelly/Shorts Stadium. has taken part in the Football Family Fest. He said every opportunity to do so is a blast. "It's fun to go outside, especially after winter," Roggenbuch said. "To see all the players do all the drills, kids get a kick out of it." L A U N N 19TH ACHOICE AWARDS! One entry per person. No Photocopies or facsimiles accepted. Must be 18 years or older to enter. To be eligible for the drawing, you must fill out at least 50 of the categories. Central Michigan Life employee are not eligible to win. To have your vote count, you must have a minimum of 30 categories selected AND provide all of the contact information requested in the box above. completed 102-of-181 passes for 1,290 yards, seven touchdowns and six interceptions. He was a six-game starter for the Volunteers in 2017 before sustaining a season-ending injury. From the defensive side of the ball, senior linebacker Michael Oliver said each quarterback has specific traits that stand out to him. “They are all good in my book,” Oliver said. “They all come ready to play, always prepare and always execute.” Despite the practice success from Dormady, Lazzaro and Moore, McElwain isn’t ready to name a quarterback. He wouldn’t even name a top group leading the way. It’s clear McElwain wants to tab the right guy as his starter. “We’ll get that ironed out as we go through the summer and see who takes leadership and ahold of this football team,” McElwain said. From everything I saw, Dormady is the guy. Otherwise, it’s Tommy time. Vote now through May 4, 2019 Vote us for Best Unique Business! Vote us for Best Auto Service! OF MIL MI Y Visit D MI., P FO C o O wwwur webs (989) TCA 77 .fam ite fo R r ilyf help 5-850 E oot ful h care ints 0 .biz ! 15 WORD MINIMUM PER CLASSIFIED AD BOLD, ITALIC AND CENTERED TYPE ARE AVAILABLE ALONG WITH OTHER SPECIAL FEATURES LIKE AD ATTRACTORS. SUDOKU To solve a sudoku, the numbers 1 - 9 must fill each row, column and box. Each number can appear only once in each row, column or box. The more numbers you can figure out the easier it gets to solve! Across 1. 5. 10. 14. 15. 16. 17. 18. 20. 21. 22. 23. 25. 26. 28. 33. 34. 36. 37. 39. 41. 42. 44. 46. 47. 49. 51. 52. 53. 57. 58. 61. 63. 64. 65. 66. 67. 68. 69. Down 1. 2. 3. 4. 5. 6. 7. 13. 19. 24. 25. 26. 27. 28. 29. 30. 31. 32. 35. 38. 40. 43. 45. 48. 50. 52. 53. 54. 55. 56. 57. 59. 60. 62.